Butler Hyundai has the new Hyundai Elantra for sale in Medford, OR. If you are in the market for a 2.0-liter, four-cylinder engine with a 6-speed Shiftronic transmission that offers the versatility of a hatchback, then we have the car you're looking for. The Elantra also comes equipped with 4-wheel disk brakes and Advanced dual front airbags with Occupant Classification System. Slide into the driver's seat of this new Hyundai and enjoy Cruise control, Bluetooth® hands-free phone system, and power door locks. With so many options that cater to your drive quality, it's no wonder why the new Hyundai Elantra is the car for you! 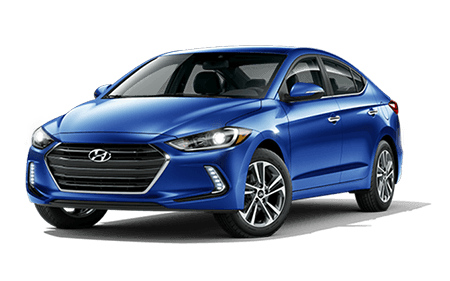 The new Hyundai Elantra offers Vehicle Stability Management, Electronic Stability Control, and a Traction Control System. It's clear that Hyundai cares about safety as much as you do. Front Seat-mounted side-impact airbags, Roof-mounted side-curtain airbags, and Driver’s knee airbag all come standard. When the unexpected happens the Anti-lock Braking System, and Electronic Brake-force Distribution will provide the stopping power you need. To support these systems the Tire Pressure Monitoring System works to ensure your tires are always properly inflated, so your tread sticks to the road. Remember our Hyundai dealership when you need to schedule your Hyundai service online for an oil change or any other maintenance. Power bodycolor outside mirrors, Solar control glass and Projector headlights are just a few of the exterior touch points on the new Hyundai Elantra. Connect with our finance department to discuss how to finance a new Hyundai Elantra. At our new and used Hyudai dealership you can apply for an auto loan or credit-challenged financing. The LED projector headlights will let other drivers know you're headed their way. Visit our Hyundai dealership near Grants Pass and Klamath Falls to test drive your next new Hyundai today!